Implementing features for your new app or website is maybe not really the hard part. Making the feature available on every platform and device is the real tough challenge to solve. What does this mean? Implementing a feature request within a responisve design for a big range of mobile phones, tablets, notebooks, desktops, and Smart TVs is daunting. 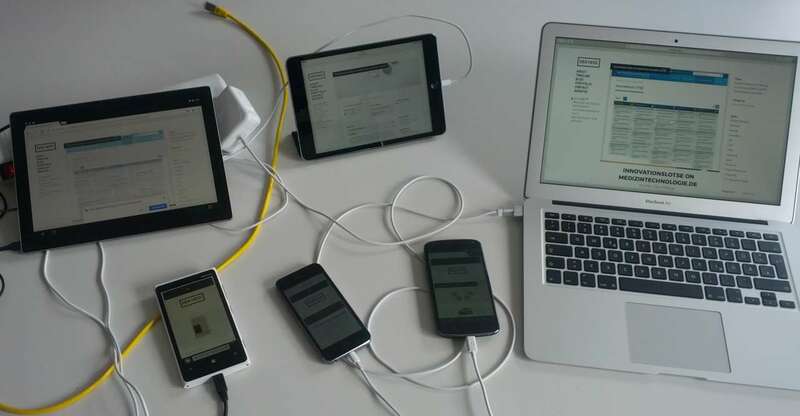 A good managed device lab for cross-device development can be your best buddy. 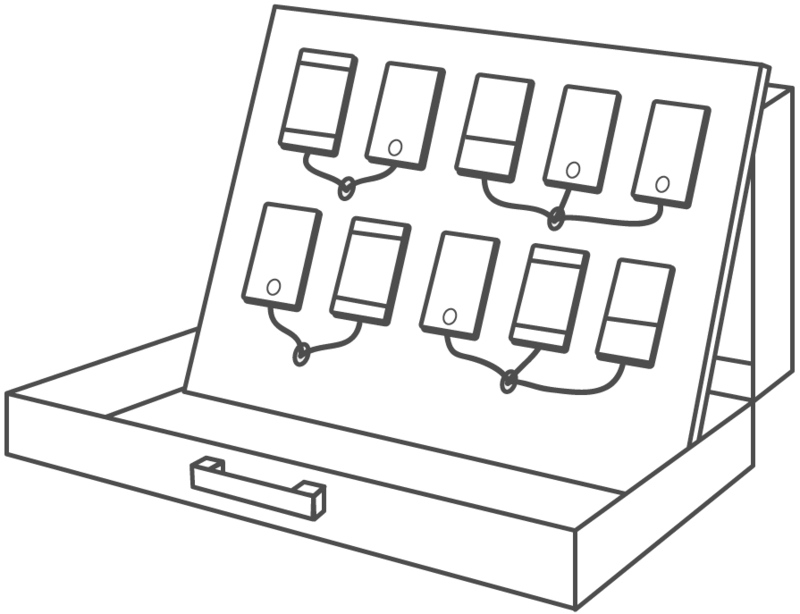 Destiny Montague and Lara Hogan wrote a very nice online book about how to set up and manage an (Open) device lab at your company. They provide some very handy background information. I highly recommend to read this book before you start any activity at your company or office. 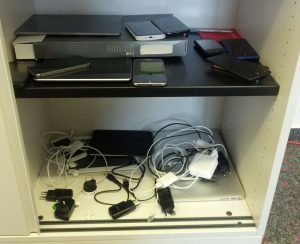 More futher list of articles about managing device labs are available on LabUp. 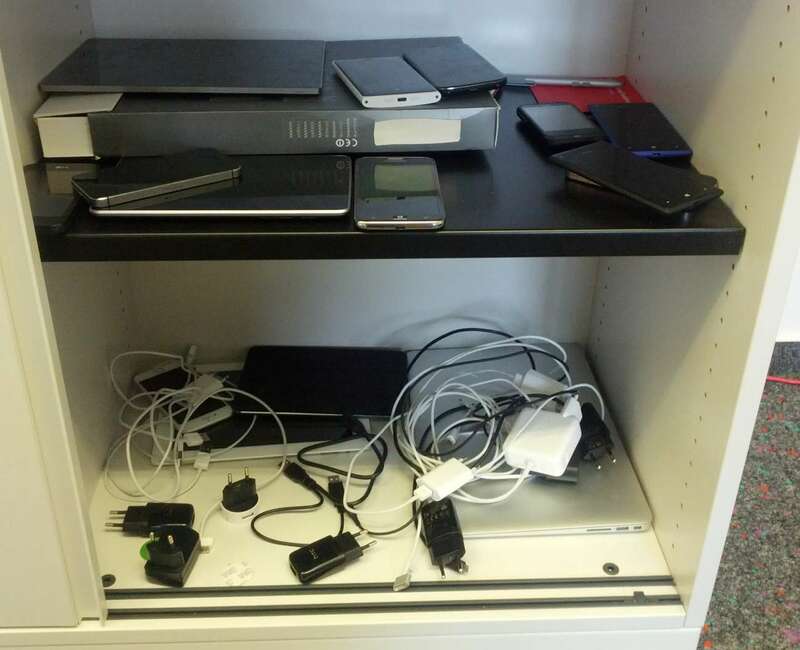 A very good range of devices are already available, but they stuck unorganized in our shelf. I can only test and debug on one platform. These circumstances made my life not really easy. Luckily, I could convince two of my coworker to join a workflow hack session for improving our daily developer life. This blog post is a short summary of our findings. 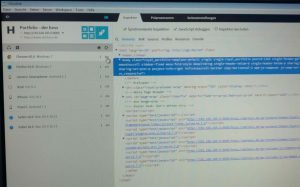 Adobe Edge Inspect used to be a great tool in fulfilling our requirements. Unfortunately, it is only available on the Adobe Creative Cloud, which is not compatible with our build process and development lifecycle. Luckily, there are more than enough other tools available on the market. After some evaluation, we have chosen Ghostlab and Browsersync.io for our workflow hacking session. 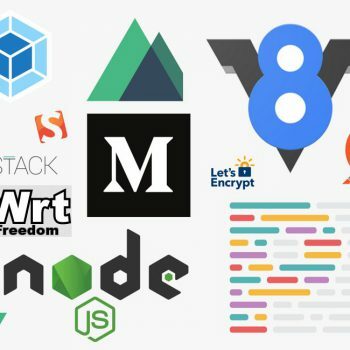 However, if your developing your frontend with common NodeJS, Gulp, Grunt and so on toolkits, then browserync.io could be a real solution for you. The internet is full with some nice starter tutorials on tutsplus.com, sitepoint.com, scotch.io and ponyfoo.com. Enjoy and have fun! Ghostlab is offered as a 7-day free trial version by Vanamco. This trial versions offers the same features as the full version. This is a perfect circumstance for giving the Ghostlab a free test run at our department. Ghostlab runs on Windows as well as on MacOS. The installations were pretty straightforward for all our team members and even our designers on their Apple Machines could use it. The “Getting started” documentation is pretty good. It enables to add other website and other remote servers very easily. Except, the testing on a embedded device caused us some headaches. Our embedded device software and the connected mobile devices were running on another network adapter as our development machine. But all devices had to be connected to our development network, which hosts our Ghostlab proxy server. It sounds more complicated than it was at the end. We just had to change the IP address within the network configuration. After that configuration, the testing on our embedded devices went very smoothly. Even debugging and code injecting worked pretty solid. Only the Internet Explorer on our Windows Phone crashed sometimes. 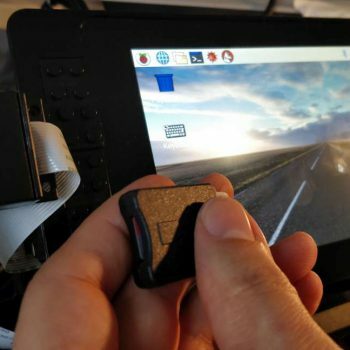 New embedded devices for additional testings could be very easy added. At the end, we were all pretty astounded about the ease of development with Ghostlab. Even their pricing strategy is more than fair with only paying once(!) 50 USD. The only caveat of Ghostlab compared to Browsersync is the (lacking) amount of documentation and less playground for customized configuration. 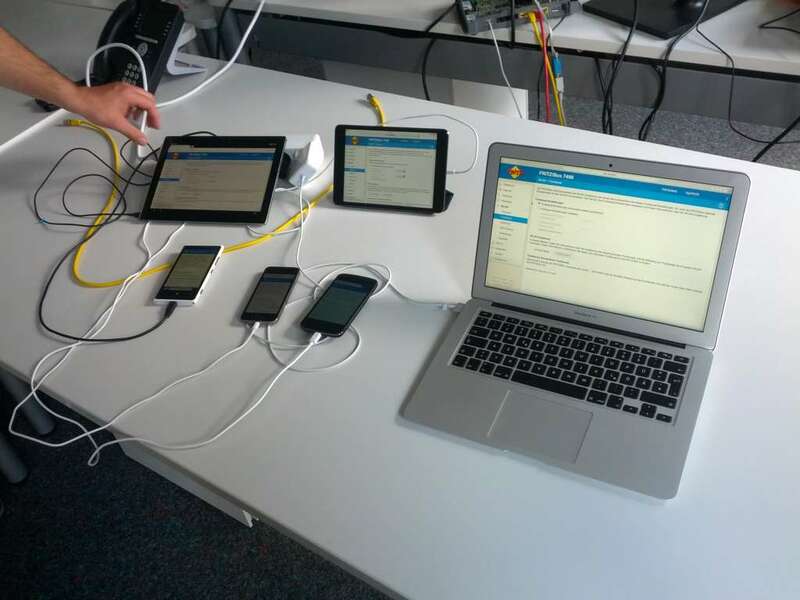 It was possible to convince our other team mates to try out the device lab approach for a longer term. Ghostlab met pretty much 100% of our development needs. The User Experience of the software was pretty cool and surprisingly easy. Debugging our Web UIs on embedded devices has almost the identical process as debugging usual web frontends with browser devtools. In our case the frontend unfortunately doesn’t run standalone without the hardware. This kills the customization power of browsersync.io. However, in our case it wasn’t needed either. Therefore, Ghostlab is our winner, yeah! Beside of this result, I figured out one important point for me. 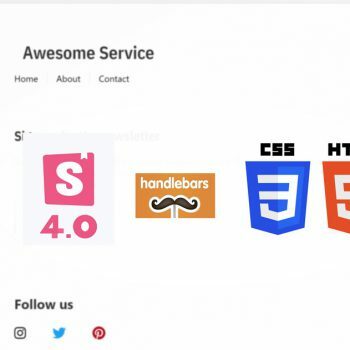 I highly recommend to encapsulate your Web UI frontend from a monolithic build system. A seperate/encapsulated build system allows you a more flexible project structure. New tools and workflow can be easier applied without breaking the build process of the hardware stack. 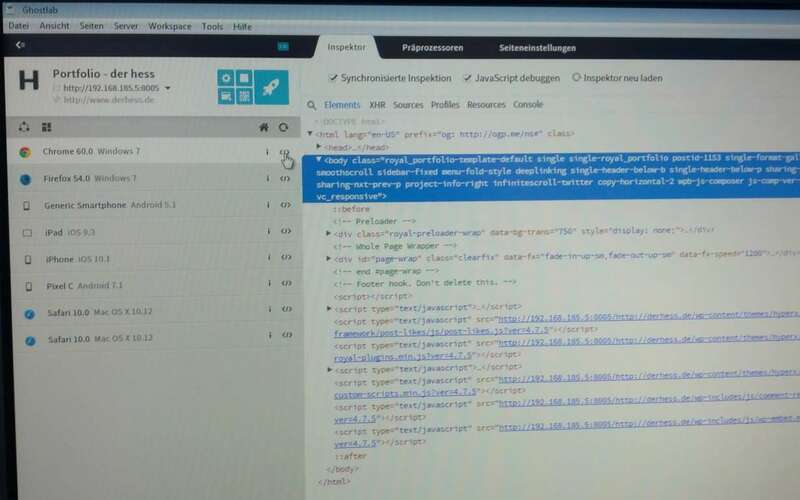 In general, that makes your cross-device testing with common webdev tools (see here, here, here and here) much more convenient (especially in context of Web of Things Apps). If you need a to simulate the hardware layer, please create a mock-up server. Tools, like Postman, enables testing your embedded device API and simultaneously produces a mock-up server for you. Even running a Continous Integration Sever might be more fun then. Check the FarmBot Frontend and the JUCI for OpenWRT as an inspiration on these ways of workflow thinking. As usual… after publishing my post I just figured out that Ethan Marcotte wrote a wonderful article about Left to our own devices. 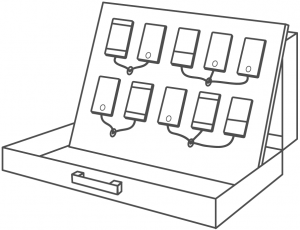 And why such Device-Agnostic Workflow will benefit your product development. A highly recommend read, thanks Matthiass Ott for the link on Twitter.